I love Christmas cards with classic motifs, both religious and secular. The more intricate the image the better. Some are pure art, and I collect those as well. 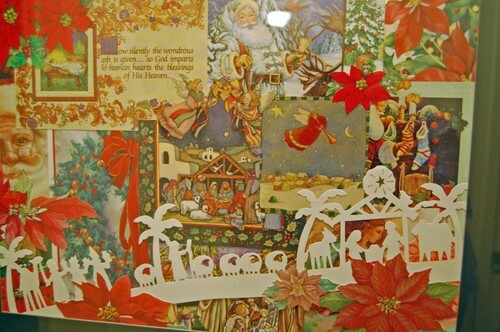 This is a framed collage that I created from Christmas cards a few years ago. Some pieces are whole, some are cropped, and some motifs I cut out with fine embroidery scissors. I worked long and hard to place each piece so others could show through arches and windows. The focal point is a trifold white silhouette nativity scene. It was an overlay on a card, but opened up it finishes off the picture beautifully. The whole thing measures 2' X 3'.